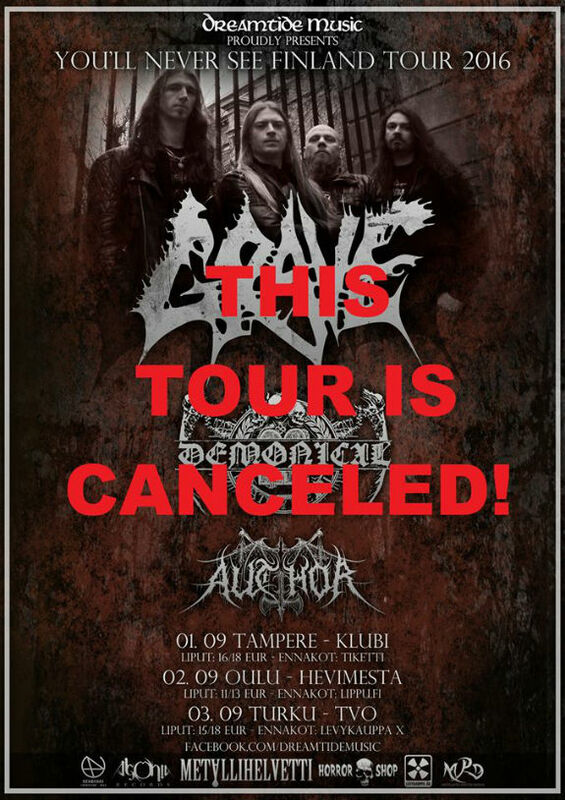 "We are very sorry to inform you that the 'You’ll Never See Finland tour' featuring Grave (swe), Demonical, (swe) and Author (fin) has been canceled! "We at Dreamtide Music tried our best to find a replacing (headliner) band suitable for the package, audience and local promoters but found it impossible with such a short notice. "We are very sorry for the whole situation and we would like to apologize to all fans, promoters and touring partners (Demonical and Author) for the inconvenience this might cause. For ticket refunds please contact the place of your purchase. Thank you for your understanding." Deny The Cross Posts "Bacteria Tribute"
Coma Cluster Void Posts "Drowning Into Sorrow"
0 Comments on "Demonical / Grave Tour Cancelled"